The most vulnerable points in a purification system? Where there is compressed air, there is water. Condensation is the moisture that drops out of an air flow as it cools and is therefore a constant threat to cause expensive problems in a compressed air system. The problems get worse if you operate lubricated reciprocating or oil flooded rotary screw compressors. Compressor oil makes its way into the distribution system with the compressed air. The mixture of oil, water and dirt tend to build up a sludge that will ultimately jam or clog production equipment, air tools and drains. Are you using the right condensate and filtration systems to keep you free of efficiency losses, maintenance headaches and premature failures? Condensate management and Filtration is a critical step in supplying clean, dry compressed air to your tools, equipment and system processes. 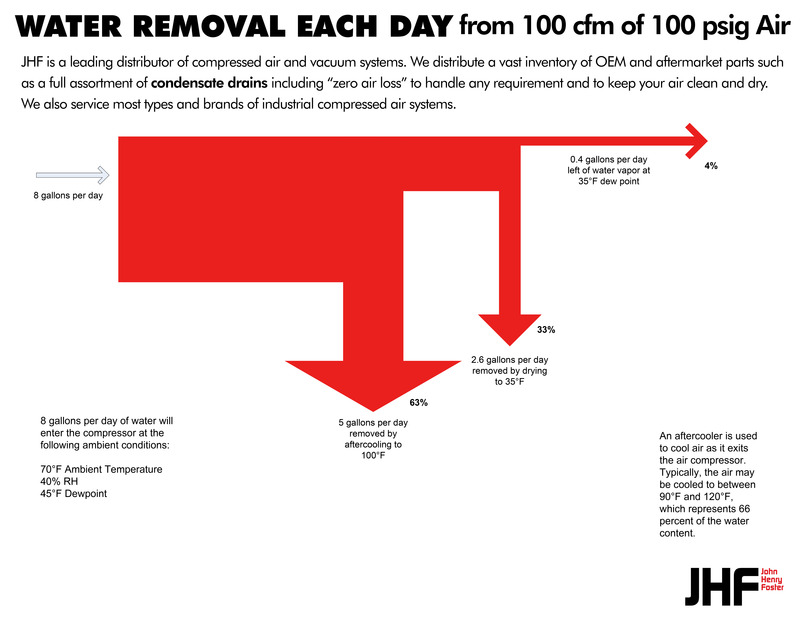 The typical compressed air system is designed to have condensation removed at strategic locations. There are drains installed at the after cooler separator, receiver tank, air dryer, in-line filters and at drain points in the piping system. The task of condensate drains is to remove the condensate from the pressurized air system safely and at low expense. See diagram above that reflects a basic compressed air system with the amount of condensate removed at key points of the after cooler separator and a refrigerated dryer. Cleaning up an air or gas supply can also be as easy as installing a filtration system. The difficulty comes from the different filtration requirements across industries. Left unchecked, the contaminants will cause efficiency losses, maintenance headaches and premature failure of pneumatic components. Condensate drains should be considered based on reliability and energy efficiency, not on initial cost. The most valuable point in a purification system is the condensate drain. When installing condensate drains, zero air-loss automatic drains with large drain ports should be utilized. They are full pressure drains, which do not consume compressed air and tend to be very reliable. Selecting the right type of filtration system for particular application is key for clean, dry air. Food and beverage, semiconductor and automotive plants, for example, all have different filtration needs based on their specific pneumatic systems and operating environments. 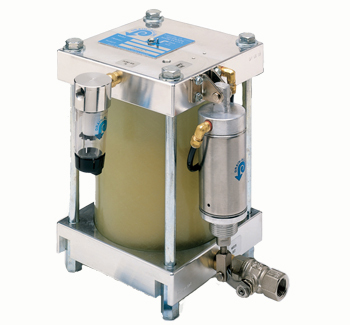 Water Separators – the centrifugal forces generated by an internal spinning mechanism, removes water and moisture. Particulate Filters – the pleated design maximizes the surface area to trap dirt particles. Coalescing filters – the design of coalescing filters differ from manufacturers and comes in different grades. Absorbing Filters – used downstream to remove oil and hydrocarbon vapor. Matching the correct condensate drains and air filter technology with specific pneumatic systems can be daunting. It’s helpful to seek out experts who can help strike the right balance between air quality and pneumatic system performance. John Henry Foster offers a vast inventory of condensate drains and filters and can make recommendations specific to your industry. Our team of experts are positioned to support your productivity and efficiency needs with our versatile products. When you are ready, please contact us at 651.452.8452 or request more information through email us to get all the information you need about condensate drains and filters, and to receive a no-obligation price quote for your application.